Fennekin's official artwork from Pokémon X and Y.
Fennekin (フォッコ, Fokko) is a fictional creature from the Pokémon universe. It appears in Super Smash Bros. 4 and Super Smash Bros. Ultimate as a Poké Ball summon. 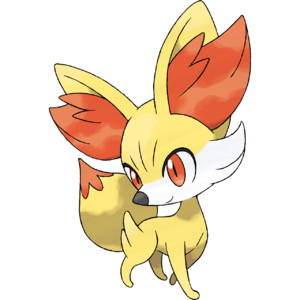 Fennekin, along with Chespin and Froakie, first appeared in Pokémon X and Y as a starter Pokémon of the Kalos Region, and is categorized within the Pokédex at #653 as the "Fox Pokémon". It evolves into Braixen at level 16 and into Delphox at level 36. Upon evolving into Delphox, it gains Psychic as its secondary type, and can access its then-signature move Mystical Fire, a Fire-type attack that damages the target and lowers the target's special attack stat one stage. Fennekin is capable of learning Incinerate via TM59. Incinerate is a Fire-type move introduced in Generation V. While weak, it has the ability to destroy Berries and Gems held by its targets, and can hit all adjacent opponents in double and triple battles. Fennekin can learn it via TM59 in Generation VI. Fennekin using Incinerate to damage Luigi. Fennekin makes its debut in Super Smash Bros. as a Poké Ball Pokémon in this installment. It uses Incinerate to attack opponents, which manifests as a fireball attack similar to Ness's PK Fire. Fennekin's trophy appears in both versions. In Super Smash Bros. for Wii U it is part of the Pokémon X and Y (1) Trophy Box. This Fire-type Pokémon is one of the first partners in Pokémon X and Y. It enjoys eating twigs, emitting hot air from its ears as it munches. Its Incinerate attack may look like small embers when it starts, but when it hits another fighter, the embers burst into a devastating pillar of flame! Want to start your journey with a Fire-type Pokémon? Then Fennekin is for you! It enjoys eating twigs as snacks, and while it's munching on them, hot air pours from its ears. Its Incinerate attack might start off looking like tiny embers, but on impact with another fighter, they'll burst into a giant pillar of flame that just keeps burning. Fennekin returns as a Poké Ball Pokémon, functioning as it did before in Smash 4. Official artwork of Fennekin from Super Smash Bros. Ultimate. Fennekin on Kalos Pokémon League. Fennekin's trophy matches its official artwork for Pokémon X and Y. This page was last edited on April 17, 2019, at 15:06.